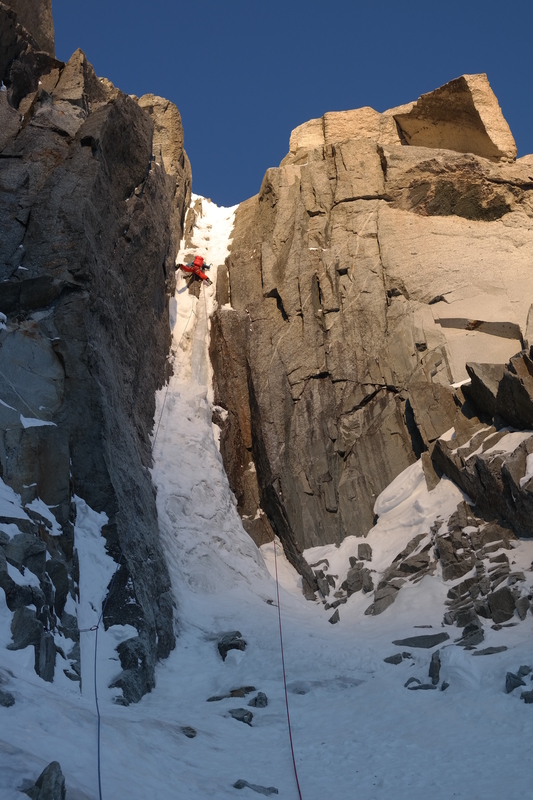 Droites north face hosts some of the longest pure ice routes in the Mont Blanc massif. I have never been very keen to get on to those, because route finding is easy, climbing straightforwad and similar all the way up. NE face in turn is a diffirent game with it´s much more challenging mixed lines. Escpecially the Chezc route incited us. Juha climbing the ice crux of the Czech route. Slightly overhanging at places. Juha seconding the mixed M6+/60m pitch of the Czech route. 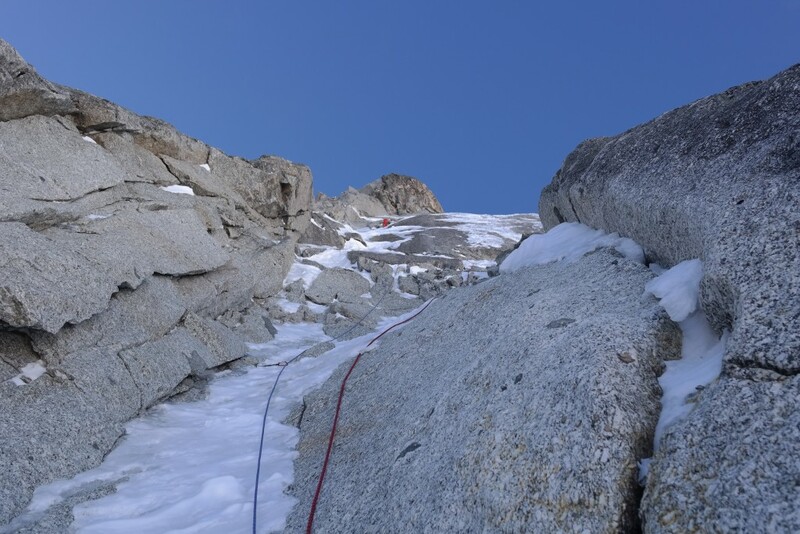 We tried the Chezc route, but got shut down by the storm top of the mixed crux, only one pitch away joining the Tournier Spur. Only option was to rappel down with heavy hearts. Two weeks later high presure returned. 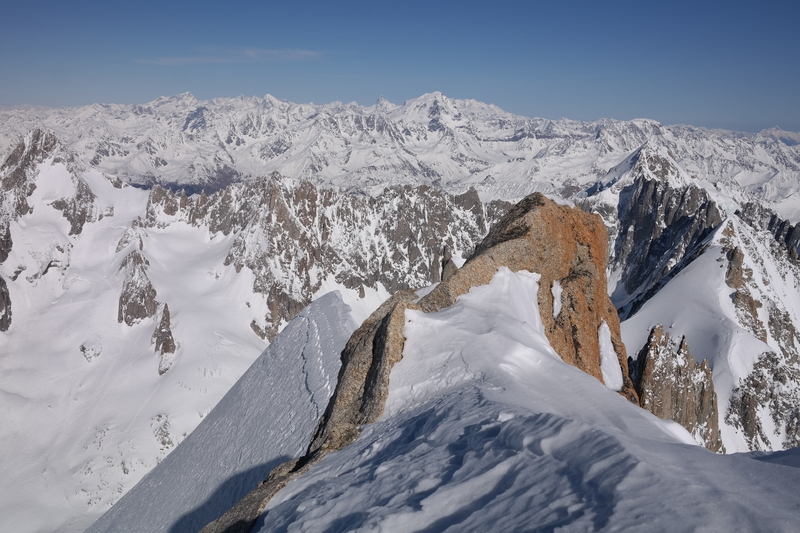 We aimed back to Droites, but this time Juha suggested that we should climb the rarely done Barnoud-Marsingy on the N face proper. It follows ice runnels on the right hand side of the face and eventually joins the upper Tournier Spur, very close to a true summit. We didn`t find any previous trip reports or other info about the route. It suited well. Weather and conditions looked good, so on the 7th of April we set up a tent onto the Argentier glacier and prepared to wake up early. 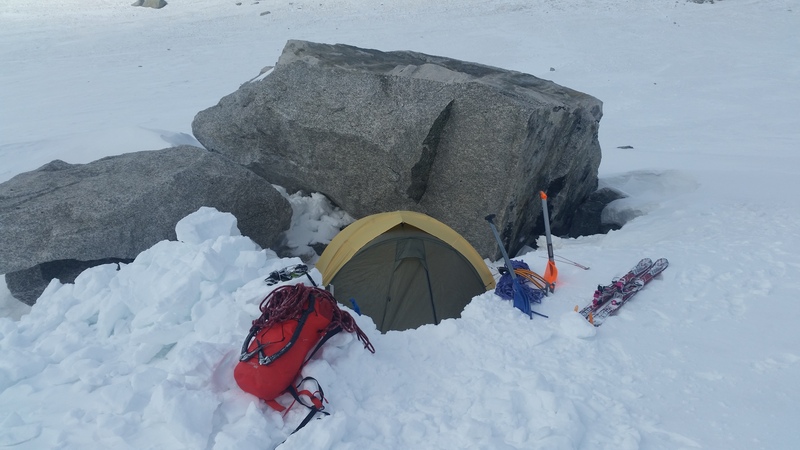 Cosy tent bivy on the Argentier glacier. Schrund was passed easily at 03:00 AM and I begun a long lead up an Alaskan like ice runnel, which covered the first rock sheet. Occassionally I was able to get a screw in, but most of the time axes hit the rock behind. No chance for a belay. Simul-climbing this 200 meters long, max 80 degree section was exciting as a first thing in the morning. Juha took a next simul lead block. Terrain was mellow angled, but suprisingly fun. The “crux” mixed pitch of the route appeared just below the sloping icefield halfway up the face. Climbing turned a bit of a boring romping fiesta. We slowly drifted towards Ginat and at one point Juha shouted that we are off the route. Eventually that proved to be a good thing as we reached the last rock band below the summit via Messner´s route, and avoided nasty sugar snow ridge climbing on the Tournier. Ice runnels halfway up the Barnoud-Marsigny. View down halfway up the route. Luca Moroni and David Bacci climbing the Ginat. 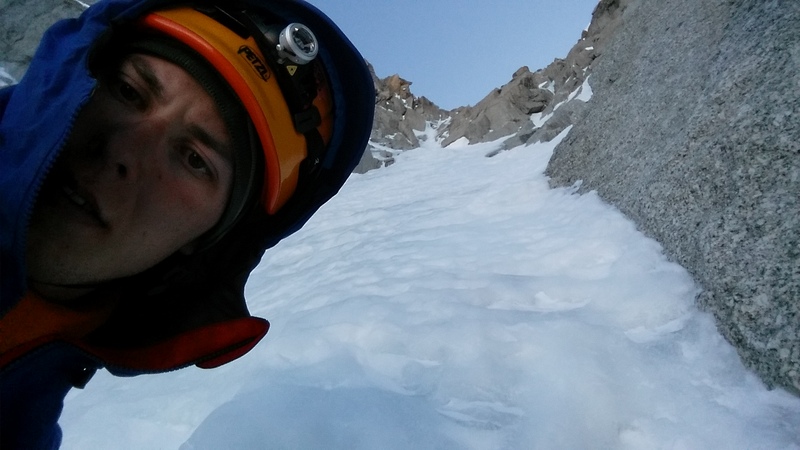 I soloed to the summit and back, because Juha wasn´t so keen to climb last 60 meters or so. 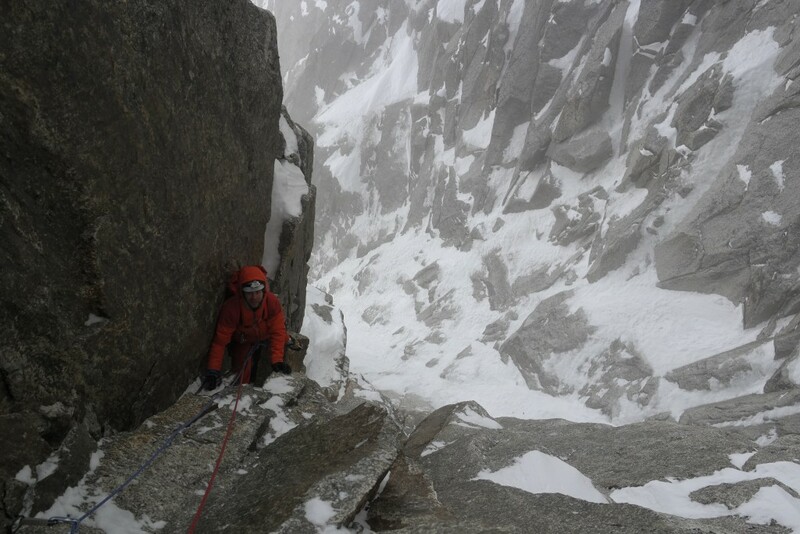 In my opinion the route ends always to the summit, but of course, remaining meters didn´t add anything new or phenomenal. On the summit of Les Droites (4001m). 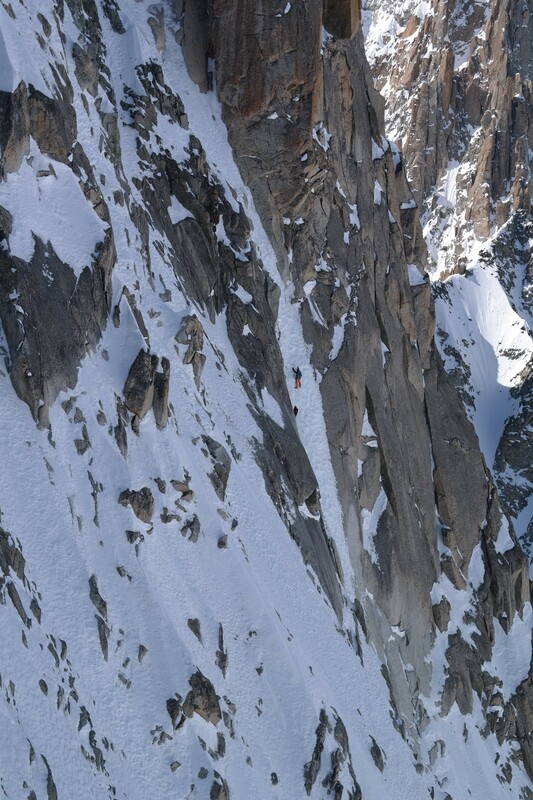 And the worst part was still to come – 1000 meters of rappelling down the Lagarde couloir to our skis. Very bad tactics! A snow pollar, no ice and eternity. 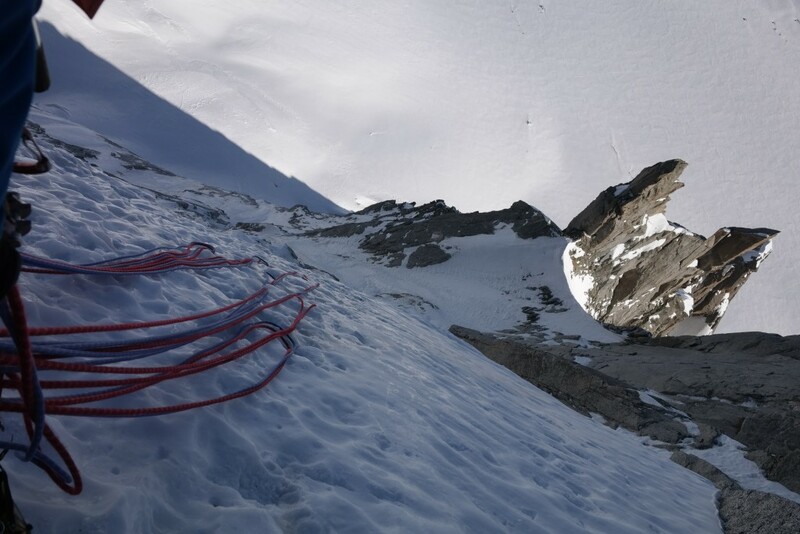 It took so long that once we´ve reached the glacier, we met people coming up to climb Lagarde. Rappelling the Lagarde wasn´t fun. 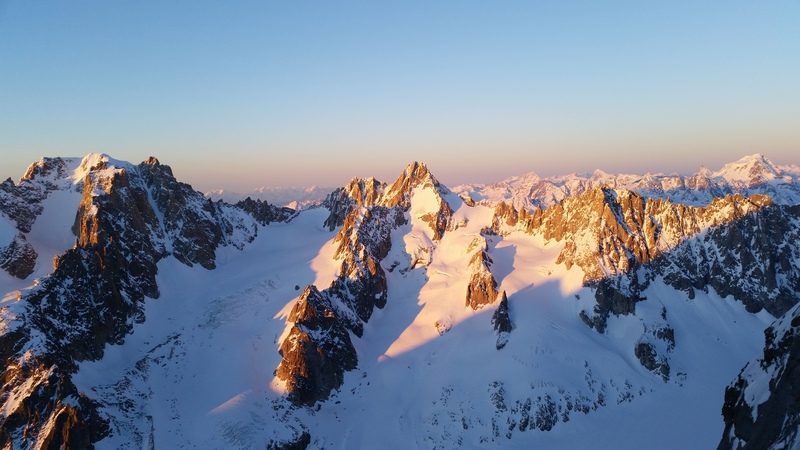 View´s over the Argentiere basin and all the way to Weisshorn were beautiful though. 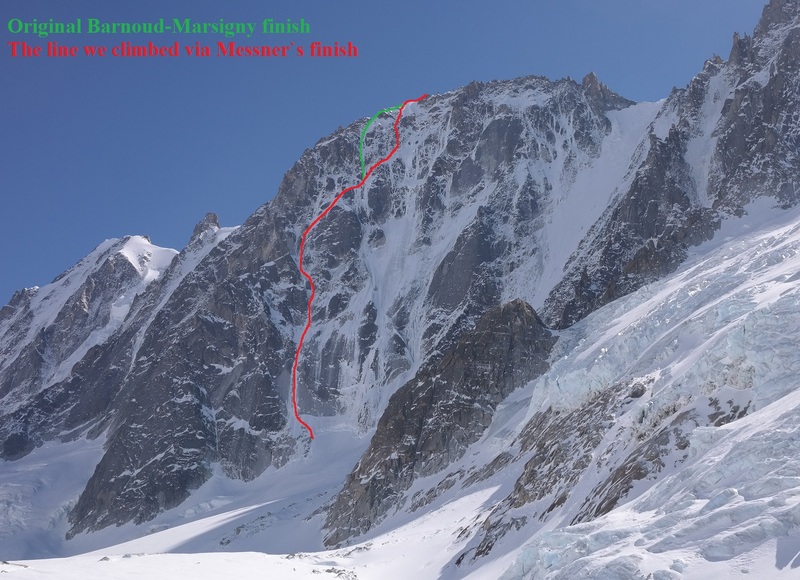 Barnoud-Marsigny is more varied then Ginat, about the same difficulty and it tops to the true summit. When Ginat is crowded think about this one. Descent via Droites normal route!